Last week I attended the Stockholm Internet Forum, launched last year by the Swedish Foreign Ministry and the Swedish Development Agency. The aim of the Forum is to gather a diverse group of people, actors and stakeholders in the field, such as bloggers, net activists, policy-makers, representatives of Internet companies, representatives of national and international institutions, such as UNESCO (see their recent report on internet freedom and privacy) and OECD, and academics to discuss how freedom and openness of the Internet can be secured, and how ICTs can help promote social and economic well-being. It was indeed an interesting and rather unique mixture of people, ranging from Swedish ministers, representatives of Yahoo, Google and Facebook, representatives from important civil society organizations and other institutions working to secure freedom on the Internet such as Privacy International, the Internet Society, and the World Wide Web Foundation, as well as famous bloggers and net activists such as Cuban journalist and blogger Yoani Sanchez. A number of academic experts in the field also attended, including Ron Deibert from the Citizen Lab, who has a new book out, Black Code, that is on my ever increasing list of books-to-read, and Tim Unwin, an authority on ICT4D. Both had written brief background papers for the event. The Forums’ website contains some valuable summaries from the panel discussions as well as participants’ Twitter-feeds. What lessons and thoughts do I take away from it? First of all, it could be said that the Forum in some ways is an exercise in Swedish soft power. The Swedish government and Sida have in recent years positioned themselves as champions of Internet freedom whilst also giving aid to net activism. While it is certainly a good thing to push for Internet freedom and help net activism, I do agree with Christian Christensen that the discourse and ideology behind the Swedish policy “reflects a liberation technology perspective on the relation between technology and sociopolitical change in developing countries…” Such a linkage is too simplistic and techno-deterministic of course as it ignores underlying socio-political issues and the existence of digital divides in many societies that means that large groups of people are unable to engage in social and political discussions either on-line or off-line. Secondly, the relationship between ICT use and development, one of the main themes of the Forum, is interesting but also very complex. Many participants stressed the importance of ICT for development as a tool to lift people out of poverty, and several provided interesting examples, but one recurrent issue raised by many participants, especially from Africa, was the huge divides between the Global North and the Global South on issues of Internet access, cost of internet connections etc. I also like Tim Unwin’s comments and thought piece where he argues that “ICTs have actually increased, rather than reduced, inequality in the world.” On ICT4D there were also some interesting discussions on how to conceptualize development relating to capabilities and human development etc. Have not had the time to read yet but look forward to read the World Wide Web Foundation’s publication Accelerating Development Using the Web: Empowering Poor and Marginalised People. One also needs to bear in mind that the digital society gives rise to new divides between the technology savvy and those with less knowledge, digital skills and digital literacy, even within affluent countries such as Sweden. A recent dissertation at Lund University, also show that social network sites have not brought about any greater equality in political participation in Sweden, and that it is people with social and cultural capital that dominates the public discussions on-line. Thirdly, I found the general discussions on freedom vs security quite interesting. As somebody pointed out at the Forum it is important that human rights people and security people meet and discuss these issues together. Ron Deibert are among those who warn of how ICTs enables governments and companies to amass huge amounts of data about individuals and infringe upon citizens’ privacy and integrity, often without us knowing about it. He develops this discussion in a recent short article. Some participants from the developing countries however felt that issues on freedom vs security were more a concern for the developed world as their main problem is that the majority of the population don’t have access to the Internet at all. However, I think issues of freedom and security are essential regardless of levels of Internet penetration, and that poor people often are more at risk to have their rights and privacy violated. To strengthen digital skills and literacy and protect rights and freedoms on-line need to go hand in hand with developing ICT use, strengthening laws and holding companies and governments accountable. It cannot wait until Internet access is more widespread in the country. Fourthly, there were many discussions on the role and power of corporations and how to hold them accountable and ensure transparency. As often has been mentioned, many of the new Internet companies act like governments but we haven’t elected them and have little insight into how they use data etc. It was mentioned that Facebook has just joined the Global Network Initiative and the question is what this will mean in practice. Fifthly, I choose to attend the session in the so-called unconference organised by the World Wide Web Foundation that has produced the Web Index, a multi-dimensional measure of the Web’s growth, utility and impact on people and nations. It is an interesting and challenging task to produce an index using the same indicators across countries to measure and compare Internet connectivity and use between and among countries, and especially to measure its impact in different fields. 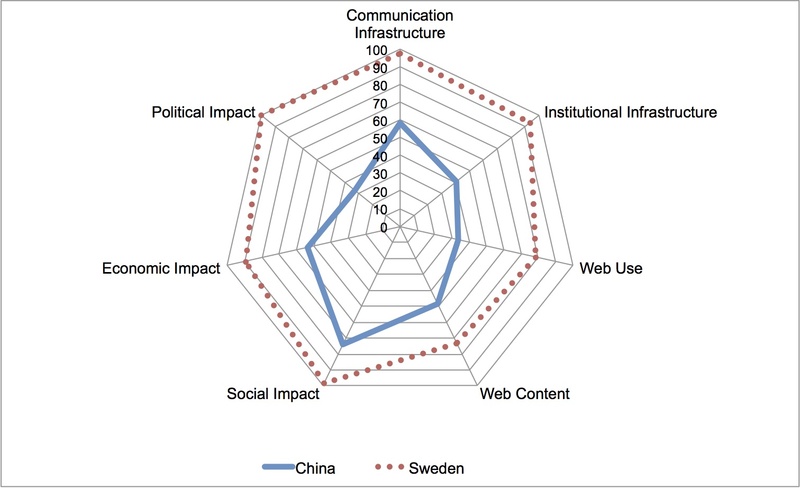 Thinking of the ranking and evaluation of China and Sweden I asked my colleague Stefan Brehm to visualize how Sweden and China compare by using their index and he produced this figure. One see some obvious differences but what lies behind these outcomes in terms of policies, laws, and visions need further studies and in-depth ethnographic research. In addition, an aggregated picture also hid cases and areas where the Internet actually has had a big political impact in China, such as some protests and revelations of corrupt officials. It is necessary to study in more detail when and why the Internet can have an impact, on which issues and in which circumstances etc. One furthermore need to differentiate between different types of ICTs and their impact. It would also be interesting to see how the two countries fare if one look at specific segments of the population such as youth, women, and the elderly, and marginalized groups such as minorities and migrant workers in the case of China and immigrants in the case of Sweden. 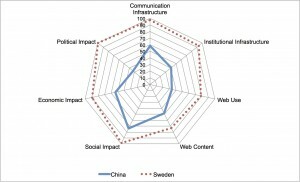 And talking of visions it is of course interesting to compare the visions behind the Swedish Digital Agenda, ICT for Everybody, with the Chinese White Paper on Internet. A topic which we might come back to. Finally, I listened to a number of creative people from organizations who work on really interesting projects. Juliana Rotich from Ushahidi a non-profit tech company that specializes in developing free and open source software for information collection, interactive mapping and data curation. They build tools for democratizing information, increasing transparency and lowering the barriers for individuals to share their stories. Usha Venkatachallam from Appropriate IT, a technology consulting company that harnesses the power and promise of the information age to advance agendas of social justice, equitable access, and inclusive international development. Laura Walker Hudson from the free desktop SMS management platform, FrontlineSMS, that works to lower barriers to using mobile and SMS all over the world. Robert Kirkpatrick from UN Global Pulse who work on harnessing big data for a real-time understanding of human well-being. I added their white paper Big Data for Development to my reading list. If the Chokepoint project get a state map up and running for China too that would be interesting. There wasn’t anything on China at the Forum, but OpenITP recently released a report, Collateral Freedom, that provides insights into the state of censorship circumvention tool usage in China. And talking of freedom of speech and the right to report, the Swedish Television recently screened a shorter TV version of the documentary High Tech, Low Life about the two Chinese citizen journalists Zola and Tiger Temple. Those in Sweden can still see the film at SVT Play. Highly recommended! This entry was posted in Uncategorized and tagged bloggers, China, Facebook, freedom, Google, ICT4D, Internet, security, Stockholm Internet Forum, Sweden, UNESCO, Yahoo. Bookmark the permalink.